Welcome to one of Michigan's Oldest Traditions! 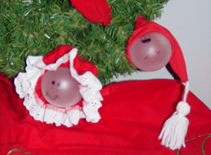 Create your own Santa and Mrs. Claus ornament! You can use a glass bulb or Styrofoam ball for a great child-friendly craft! Granny cap also fits a mason jar, so you can wrap up your favorite homemade treats. Flannel. Made in the USA. 100% Cotton. Where can you wear your Red Flannels? The Red Flannel Factory is a home-based business. PLEASE CALL AHEAD before stopping by. By appointment only. We take cash or checks at the office. Copyright Red Flannels. All Rights Reserved. eCommerce Software by 3dcart. The Red Flannel Factory is a home-based business. PLEASE CALL AHEAD before stopping by. By appointment only.